Well, I can’t be sure, but maybe Microsoft took note of that and moved the power options off the start button.Â The thing is, they did it after we have all been trained to go looking for it there.Â So it is of no surprise that there are a number of people that are frustrated because they can’t figure out how to turn off their Windows 8 computer. 1. Access the power options by pressing ctl-alt-del key combination (hold all keys down at the same time. )Â This isÂ the old and true way of accessing the power options, but it does require a keyboard. 2. Display the “charms” menu on the right side of the screen by using theÂ keyboard Win-C orÂ hovering / touching either the upper right or lower right corners of the screen.Â On the charms menu select “Settings”, then select “Power” from the settings menu. 3. 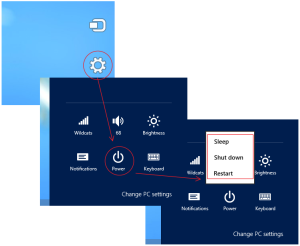 Another way to get to roughly the same place is to use the Windows shortcut key Win-I.Â This displays the Settings panel which allows you to access the Power options. 4. And if you are on the desktop view you could press the Alt-F4 key combination which performs a close of the currently displayed application, which in this case is the Windows desktop so it wants to shutdown Windows. And of course, there are more advanced ways such as entering a run command, but for most people the above options will be the best.Â Oh, and I forgot one other option… the power button :)Â But remember that the power button can be programmed for different actions. Some people program it to power down the system, others put it to sleep, some hibernate, and others simply program the power button to do nothing.